We welcome Leeann W. Bass who is a graduate student from Emory College of Arts and Science. 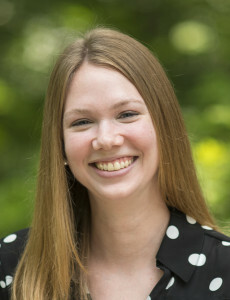 She is also a Ph.D.-candidate at the Laney Graduate School of Emory University and Woodruff Fellow in Statistical Data Services at the Emory Center for Digital Scholarship. LeeAnn’s main research field is judicial politics. You can find more information about LeeAnn here. She is teaching a class in “Introduction to Applied Statistical Analysis Using R” during June 2016. Our new book is out and can be ordered via ECPR Press. How, and under which conditions, can consultative committees exert influence if they have access to legislators (voice) but no formal veto power (vote)? 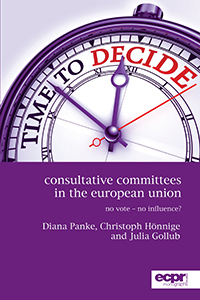 In drawing on the Committee of the Regions and the European Economic and Social Committee of the European Union, this book shows that consultative committees face several challenges when it comes to influencing the content of policies, but are nevertheless sometimes successful in getting their opinions heard. It develops a sender-receiver model and puts it to a comprehensive empirical test. A quantitative analysis and three in-depth case studies on the European citizens’ initiative, the European grouping of territorial cooperation and the Liberalisation of Community Postal Services show how capacities, incentives and preferences of consultative committees and legislative decision-makers need to be configured to allow for the influence of the CoR and the EESC. I will change my institutional affiliation from September 1st, 2014 onwards. I enjoyed my time at Göttingen during the last three years. I look forward to my new position as Chair for Comparative and German Politics at the Institute for Political Science at the Leibniz University Hannover. Benjamin Engst has won a DAAD scholarship to work on his Ph.D. thesis on autolimitation at the Bundesverfassungsgericht for one year at the Department of Political Science at Emory University. We congratulate him! During his stay he will be supervised by Tom Clark and Jeffrey Staton. Dr. Andreas Schmid received his Ph.D. with a thesis entitled “Verwaltungsreform im politischen System: Eine empirische Analyse und Bewertung auf Basis der Reform des Haushalts- und Rechnungswesens öffentlicher Verwaltungen” in 2012 under my supervision. He was appointed Professor at the at the University of Applied Sciences Harz recently. Great news! Sylvain Brouard and Christoph Hönnige will offer a section (S036)on Law, Courts and Judicial Politics consisting of 8 panels at the next ECPR General Conference in Glasgow from 3.-6.9.2014. Reza Fathurrahman will be on a field research trip for his Ph.D. thesis in Indonesia from May to October 2014 to conduct several interviews. Sarah Sinram has been to the University of Uppsala within the context of the U4 network (Universities of Groningen, Ghent, Göttingen and Uppsala) from September to December 2013. The stay was financed by a scholarship of the DAAD. We congratulate her! She was working on her Ph.D. thesis on comparative welfare systems under the supervision of the internationally renowned Professor Joakim Palme. Reports about her stay can be found on the webpage of the U4 network and the uni-inform of the University of Göttingen. I will be on paternity leave during the winter term 2013/14 (1.10.2013-31.3.2014). Courses will be offered by Prof. Dr. Eric Linhart. I will only rarely check my email and not be able to respond regularly. A short article about the work in the DFG project Das Bundesverfassungsgericht als Vetospieler appeared in the newspaper Südwestpresse on April 5th, 2013. The article can be found here.